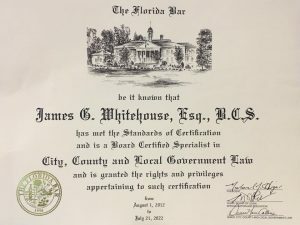 St. Johns Law Group is proud to announce the Florida Bar’s Recognition and continued Certification of James G. Whitehouse, Esq. as a Board Certified Expert and Specialist in City, County & Local Government Law. Certification is The Florida Bar’s highest level of evaluation of the competency and experience of attorneys approved by the Supreme Court of Florida. Established in 1982 by the Florida Supreme Court, board certification helps consumers identify specialists and experts in areas of the law. Board certified Florida Bar members are the only Florida attorneys allowed to identify themselves as ”Board Certified” “Specialist” or “Expert” or to use the letters “B.C.S.” for Board Certified Specialist.